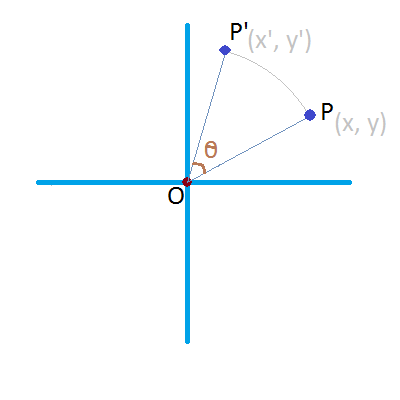 "Rotation of a point P by some angle θ" - This concept gave me some hard time. Especially because I failed to understand the proof for its formula. And I was poor at remembering formulae. So... I thought of coming up with some simple explaination about this concept and its formula with a reasonable simple to understand explaination. Lets consider the problem. We have a point P(x, y). 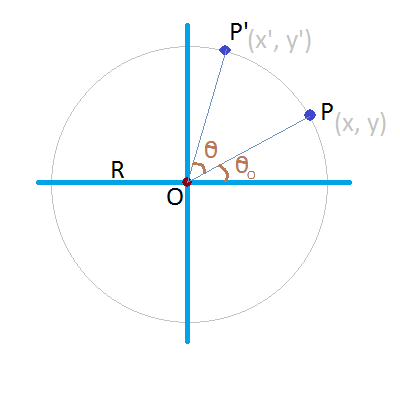 When the line segment OP is rotated by an angle θ, the rotated line segment is represented by OP'. lets assume that OP makes an angle θ0 with the positive X-axis. If we draw a circle of radius R and center at the origin, we get the following graph.